I know I said this in my 72-Hour (Semi) Sourdough Bread post: Making a sourdough starter is straightforward enough, but unless you're making a loaf or two every week, keeping a sourdough starter going is more trouble than keeping a cat! But you know what? It really isn't that much trouble! You can make your own sourdough starter using nothing but equal weights of organic unbleached all-purpose flour and filtered water. You can do this with measuring cups, but a digital scale is a must if you're a stickler for accuracy. With a digital scale it is a simple matter to just set the bowl on the scale, press the Zero button to temporarily set the scale to zero, spoon in flour until it registers so many grams or ounces, press the Zero button again and then pour in water until it registers the same number of grams or ounces on the scale. But if you don't have a digital scale and don't plan to get one, you can make a sourdough starter just fine with your measuring cups and spoons. Just pick a measuring method, cups and spoons, ounces or grams, and stay with it throughout. I'm no expert on sourdough, but one thing I've learned is that sourdough is more art than science. So I'm more inclined to go with those experts who wing it a bit than with those who insist on precise measurements. Start with maybe 2 tablespoons of flour and 1 1/2 tablespoons of water (roughly equal in weight). If using a scale and going by ounces, start with maybe 1/2 or 3/4 ounce of each. If going by grams, maybe 15 grams of each. 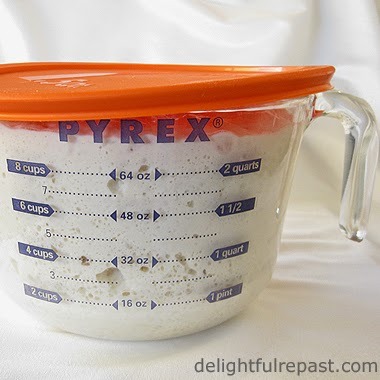 Tip: For the same reason I recommend making the starter in a 2-cup glass measure (so you can easily tell how much it has risen), I like to use a 2-quart glass measure for the dough when making Sourdough Sandwich Bread or other not-too-large recipes. You should start with a very small amount of flour and water because at a certain point you'll be discarding* some of the starter. If you're using large amounts, you'll be wasting a lot of flour. Of course, rather than throwing it in the trash you could compost it or even use it in a recipe such as sourdough pancakes. * But with my method you'll be discarding far less of the starter initially and none at all throughout the years you're using it! Your starter might be "ready" in one week, or it might take 2 weeks or more. So plan on babysitting your starter for at least 2 weeks. It will continue to develop flavor and strength, some say for another 30 to 90 days. Since this will be on the counter for a week or two, pick a spot where it won't be in the way and where the temperature will be fairly consistent (70 to 75 degrees would be ideal). Pick a time of day that will suit your schedule; you'll need to feed your starter about the same time every day. If you use a straight-sided clear container, it's very easy to watch your starter's progress. A wide-mouth pint glass jar is fine, but I found I prefer a 2-cup glass measure. Then I store the starter in the jar with a square of plastic wrap held in place by a loose canning ring. You'll find people who tell you to use grapes, cabbage leaves, pineapple juice, certain grains of one sort or another, or even milk to make your starter. Some people say you cannot make it in a metal container or even use a metal spoon. Some people insist you must use a scale and be very precise. I'm not saying those things don't work. If that's how you make and maintain a sourdough starter, stay with it. But if you're new to the game, I'd say try it this way first. Sourdough starter really isn't all that fussy. I use organic unbleached all-purpose flour and filtered tap water. Day 1 In glass or ceramic 1-pint container, stir 2 tablespoons flour and 1 1/2 tablespoons water until smooth. Cover loosely with plastic wrap or a slightly ajar lid. Or 1/2 ounce or 15 grams of each. Day 2 You may or may not see a few bubbles in your starter. Feed the starter same amounts; stir vigorously until smooth. Cover loosely with plastic wrap or slightly ajar lid. Day 3 You will probably be seeing some bubbles now, and the starter will be smelling a little sour. Feed the starter again, just as on Day 2. Day 4 The starter should be very bubbly and may have doubled in volume at some point, and it should be smelling quite sour. Also, it should be looser in consistency. Feed the starter again, just as on Days 2 and 3. Tip: The speed at which sourdough starter develops depends on many things. My latest batch of starter did not double until Day 12. Day 5 The starter should be frothy and may have doubled again since yesterday. It should smell even more sour and be even looser in consistency. This time, discard all but 1/4 cup starter and feed it with 1/4 cup flour and 3 tablespoons water. Or 2 ounces or 60 grams and feed it with 2 ounces or 60 grams each flour and water. Tip: At some point in the process, your starter may start smelling like acetone (nail polish remover); don't be alarmed, just carry on. Or it may develop a layer of liquid ("hooch") on top; just stir it in and carry on. Day 6 Discard all but 1/4 cup of the starter and feed it with 1/4 cup flour and 3 tablespoons water. Or 2 ounces or 60 grams and feed it with 2 ounces or 60 grams each flour and water. Day 7 Repeat as on Day 6. Day 8 Sourdough starter is ready to use when it is both one week old and doubling in size between feedings. On Day 8 it will be one week old, but if it is not doubling, just be patient and keep going! It may take 2 weeks. Keep discarding and feeding. Tip: At this rate of feeding, after one week you will have at least a cup of starter--enough for a recipe and to hold back 1 ounce of starter to store and build up again for a recipe. 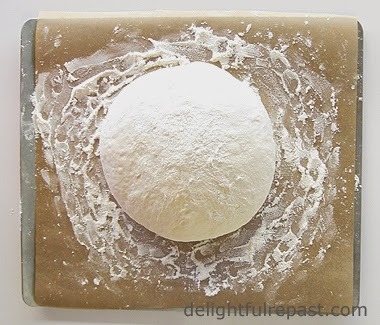 If it's not ready, though, you'll want to proceed with a reduced amount of starter to be fed with equal weights of flour and water until it can double itself between feedings. Update 10/28/17: I've kept my little batch of starter in a little half-pint jar (no discarding ever) since 2014. Cover it and refrigerate. Get into the habit of taking the starter out and feeding it once a week, letting it sit out overnight before returning it to the refrigerator. It will continue to develop flavor and strength, some say for another 30 to 90 days. Make Sourdough Artisan Bread or Sourdough Sandwich Bread. Check out my Sourdough Bread Tips. Thank you, Amy! Hope you have a fabulous 2015! This is a huge inspiration to me, I have wanted to tackle sour dough bread for the longest time...I love your step by step instructions, pinning this for sure! Sue, that makes me so happy! I hope you'll try it soon. Do let me know if you have any questions along the way! I gave up on sourdough years ago, but you've inspired me to try it again... I love your sensible suggestions! Jacqueline, thanks! I hope you will try my "sensible" way of doing it soon! Let me know how it works for you. Yum! I love your analogy of keeping a sour dough starter going to keeping a cat! I agree that it isn't really that much trouble! As usual you make it look so yummy. 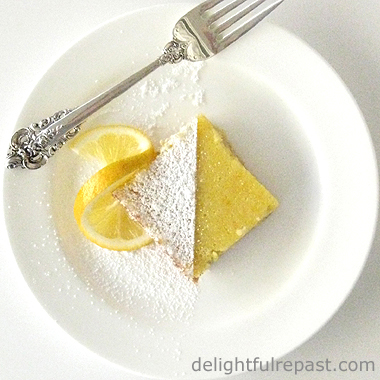 I am putting this recipe in my Delightful Repast recipe file and will be making up a batch soon! That's great, Sue! It might take two weeks to get your starter going, but it's just one little minute once a day. Let me know how it goes. Jean, you had me laughing. "more trouble than a cat." Ha! Ha! "wing it a bit," Ho! Ho! "you could compost it."He! He! "plan on babysitting it." Ha! Ho! He! The analogies kept on coming. Sounds good whatever sour-dough is!!!? I have heard of it of course. What do you do with it, apart from all of the above? Thanks, Tony! Glad I gave you a smile! Sourdough starter will give you the most delicious bread and toast. Stir up a starter -- as pets go, it's very quiet and doesn't shed! Reminds me of why I switched out of chemical engineering. Didn’t want to make tomato paste in Dow Chemical’s back lab forever and anon. I still have enough chemistry paraphernalia on hand to get halfway through your recipe, I think. But it might get tricky in the step where I start up the nuclear reactor and put the framis in the giblotz. So my current recipe for starter sourdough is to start the car and drive to the store. Still, I admire you all you Harry Potter and Hermione types who dabble in brews and concoctions while waving a soup ladle around! LOL Sully, you should see me in my onion goggles - I *really* look like I'm dabbling in my la-BOR-a-tree! I do love sourdough, but I might have to wait till I'm an empty nester. I'm not sure if I could keep it going. But this is a great tutorial and I am definitely pinning it. Thanks for sharing it with us at Foodie Fridays! Wishing you a wonderful holiday! Years ago my aunt gave me some of her sourdough starter that had been given to her from the Basque region of Spain. I kept it up for many years while living in San Francisco but at the time I was in art school and keeping it up became to much and I got rid of it. Sure wish I had it now! But then I could start my own again with your recipe here. I make homemade pizza with my own dough every week and what I do is save a few ounces from the last batch and add it to the new batch. I still add yeast (maybe I shouldn't) and it has a nice sourdough taste. Especially when I wait a couple of days before using the new dough. Mmmmmm I'm glad it's Pizza Friday! MIchelle, thank you so much! Have a safe holiday and a terrific 2015! Greg, thank you. Wow, South America for almost a month! That should give you stories for a lifetime! Buen viaje. A great follow-up post to the sourdough bread, Jean! Your directives/descriptions for the process were spot on. Happy baking my friend. Thanks, Brooks! I try to write recipes and directions so clearly that cooks at any level can succeed. Can't expect all my readers to be highly skilled professional bakers like you! Happy baking. I've been wanting to try this. Now is the time. Thanks for sharing! Glad to have met you over on twitter and now here Jean! Thanks, Laura! Glad to meet *you*! You're going to love making sourdough. Making the starter takes all of one minute once a day. Might take a couple weeks, so be patient. 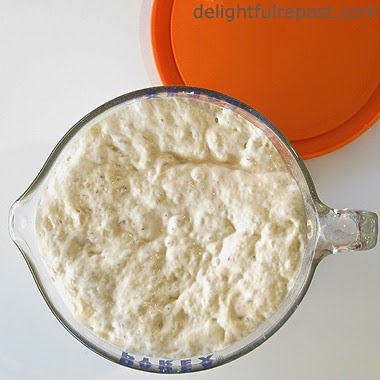 Very useful post, I too love sourdough bread, thanks for sharing with Hearth and soul blog hop. pinning. Thank you, Swathi. I've inspired a few people to start a starter with this post. Makes me happy! Kirsty, I've heard of people finding red spots on their starter. I'm not sure what it is, but people seem to be pretty unanimous about throwing it out. I think if I were on Day 14 and I noticed it, I might be tempted to scoop out some starter that is well away from any red spots and just carry on. But if I were at the beginning as you are, I'd definitely bin it and start over. 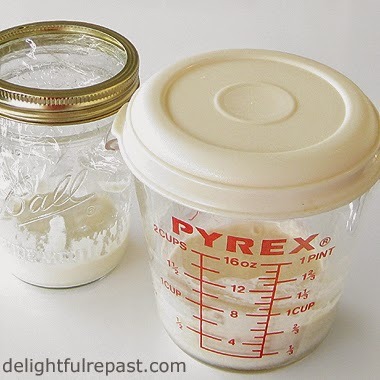 I would make my starter in a pint jar or a glass pint measuring cup that has either been sterilized as for canning or simply run through the dishwasher. Did you use filtered water? That's a must. I'm not talking Evian or anything, just ordinary bottled water or water you've run through a Brita pitcher. Do keep me posted! It's so interesting because sourdough is a living thing and anything can happen! Oh but don't worry about a pungent smell. It should smell sour, fermented, vinegary, sometimes like alcohol and even nail polish remover. Kirsty, I can't wait to hear about Attempt #2! It takes patience to start a starter, but don't give up. We'll sort this out! TLG, I am soooo glad! I know you're going to love working with sourdough. Keep me posted on your progress!